Canada’s Restoration Services in Caledon is experienced and certified with IICRC for effective removal & mold remediation of Mold Spores and Growth from buildings, homes and personal possessions. 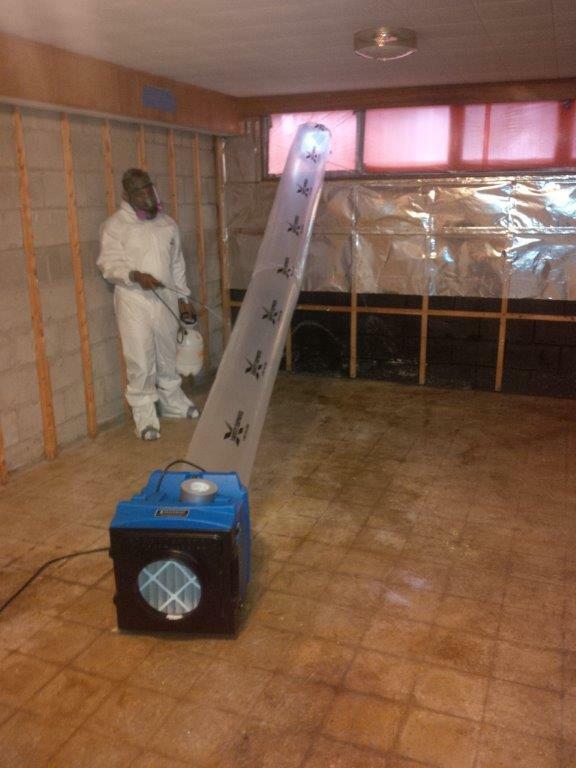 Canada's Restoration Services has experience with small remediation jobs (1 ft. of mold) to full remediation projects such as Grow Ops. Canada’s Restoration Services’ objective is to ensure no presence of Mold (air born or visible) exists once we complete the project. For this process we have many different types of equipment available to us such as: media blasting, air scrubbers and negative air machines, thermal cameras and more. Canada’s Restoration Services in Ajax works with 3rd party experts such as hygienists and certified inspectors in order to prevent a conflict of interest. IF YOUR HOME OR PROPERTY HAS MOLD GROWTH, GIVE US A CALL TODAY. WE WILL SCHEDULE A FREE MOLD INSPECTION! Canada’s Restoration Services in Caledon are experts and understands how to make the air you breathe safe. The quality of the air in your home or office, measured by spore count, should agree with that of the air outside. By completing an Air Quality Test (AQT) we are able to determine the mold spores count in your home or office. Should the AQT confirm that there are an unsafe amount of mold spores the customer is presented with a scope of work created by Canada’s Restoration Services or written by a 3rd party all in alliance with the IICRC guidelines for Mold Removal and Mold Remediation. Canada’s Restoration Services has a preferred Six Step Process for a Successful Mold Remediation. If you feel you may have the signs and symptoms of a mold reaction contact a mold professional in Ajax today. IF YOU HAVE VISIBLE MOLD OR YOU ARE EXPERIENCING SYMPTOMS CONTACT US TODAY FOR A FREE CERTIFIED VISIBLE MOLD INSPECTION IN AJAX.